I am really shocked! I know there are more important deaths to talk about, but there are a few reflections I would like to share that have valuable life lessons for me. I personally was extremely inspired by Anthony Bourdain's travels, success story, and I learned so much from his travels about what to eat in each country, and learned to be brave in trying new things. In fact, I own his entire collection of episodes and use them as a reference when travelling. He was a chef who was stuck inside a kitchen working long hours, wrote a best selling book in his spare time, and from there, his dunya success was nonstop. His work in supporting Palestinians through his show and humanzing them is just monumental! Then again, we could clearly see the pattern. Someone who has achieved everything they could achieve in life: fame, money, awards, travels, you wonder, how could someone like this commit suicide? Let's be honest. There are many of us who could only DREAM to have even one-tenth of his life! Believing in an afterlife and a Creator protects a person from many forms of depression, as they live for a higher purporse (although religious people may have depression too for chemical imbalances or from other life traumas, so don't mix both please!). Make time for people. Talk to them, listen to their pains. You never know how many lives you could save when you save someone from depression. When you empathize with their pains! 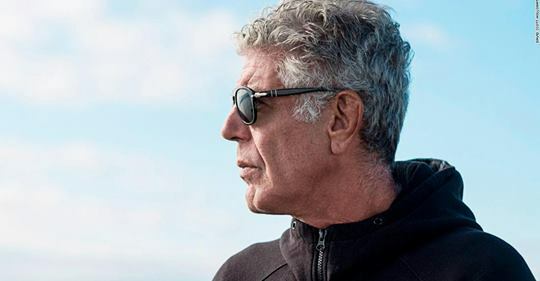 Robin Williams, Michael Jackson, Anthony Bourdain, and many others, remind us that even if you appear to have it all, you may still suffer depression, which is intensified by not having a purpose and not having a connection with our Creator or afterlife. Return to your lord, and seek his help. Especially in these blessed days! Thank you Anthony for inspiring me to travel, try food that I never imagined to try, and teaching me about other cultures. I learned from you that even if a person is small and unknown, they could work hard to make their message global, not just food, but for a bigger and better legacy. It is sad that even though you have visited many Muslim countries, you didn't find your path to guidance. You are now with your Creator! P.S I know he used foul language a lot in his shows, and that's really bad, but always observe and see what positive things you can learn from each person you meet, regardless of their background.